Does the heated air output at vent registers seem to have slowed down? Are your registers clogged with dust and debris and blowing it into your home? Do family members with asthma or allergies suffer more now than in the past? Have you noticed air leaks in your ductwork? These are just some of the problems Lawson Home Services can fix. We are your trusted resource for duct blasting and all necessary duct repairs. We offer Free Estimates in Dover, Bear, Wilmington, Middletown, Salisbury, Newark, Hockessin, Claymont, Berlin, Easton, Seaford, Stevensville, Millsboro, Grasonville, Georgetown, Lewes, Centreville and throughout Delmarva. "Everyone worked very hard and were very friendly. Great work!" What Can Go Wrong with Ductwork? 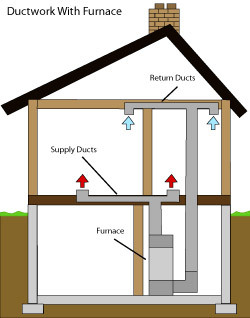 Ducts are important components of any forced-air heating or cooling system. They carry conditioned air, moved by a large blower, from your furnace and/or air conditioner to the interior of your home and then back again to be reconditioned. Furnace filters, air cleaners, and humidifiers are often housed within the ductwork as well. As simple as they look, there are a lot of things that can go wrong with ducts. Ill-fitting ducts, loose joints, and rips and splits can leak enormous amounts of conditioned air into places where it doesn't help you stay warm or cool, like basements, attics and wall cavities. Crushed or broken ducts can restrict or divert air flow all together. Un-insulated and unsealed duct joints also waste valuable heat and reduce the effectiveness of a central air conditioning system. Accessories like dehumidifiers, ill-fitting or dirty filters, and old air cleaners, which are often installed in ducts, are other places that may be wasting energy. Leaky basement ducts can also create pressure imbalances between parts of your home with undesirable results. In a crawlspace or basement, for example, leaks can draw air from these spaces into the room situated above them. This air, often filled with dust or mold spores, is a prime cause of indoor air pollution and respiratory illnesses like asthma and allergies. Imagine that money, not air, is flowing through your ducts (the money you've spent to heat or cool air). In ducts that are not sealed or insulated, or in need of repair, up to 40 percent of the dollar bills slip out the cracks whenever you turn on the furnace or air conditioner. By fixing your ductwork, those dollars never leave your wallet. In fact, the payback for ductwork improvements is typically a few years. After that, it's pure savings, month after month, and year after year. There are several ways Lawson Home Services can make your ducts more energy efficient. One is to seal them with mastic approved for ductwork that won't crack or peel. Every joint and hole is covered. Then, if insulation is necessary, we can add it in several ways – including sprayed-on polyurethane foam insulation that seals against air leakage and provides a thermal barrier, too. The interior surfaces of ducts sometimes collect dust. A thin film is normal – it will probably stay put for years. More than that, however, can be bad news for your indoor air quality. Ducts can be contaminated by air leaking into them from places like basements, crawl spaces and attics. Dust can also enter through air return grills, especially during messy home remodeling projects. Some particles manage to pass through (or around) your furnace filter. Sometimes wall or floor cavities are used as ducts, instead of sheet metal or flexible ducting. In such cases, large quantities of dust can accumulate. In extreme cases debris can be carried into ducts by insect pests or rodents. Our duct cleaning technicians have the right equipment for removing contaminants – without any risk of releasing them back into the air of your home. Nor will we try to sell you unnecessary services, such as expensive spray-in-duct sealants. Contact us today for a free ductwork inspection (duct blasting) and estimate in Bear, Wilmington, Dover, Salisbury, Newark, Easton, Middletown, Claymont, Berlin, Hockessin, Grasonville, Seaford, Stevensville, Centreville, Georgetown, Lewes, Millsboro. Duct Cleaning in Milton, DE.